A boy who has been forced into the Reapers' Game. He wouldn't be caught dead without his headphones... and wants nothing more than to shut other people out. But Sora, and his other new friends, may have the power to change him. A participant of the Reapers' Game, he always wears his headphones. Official art from The World Ends with You. 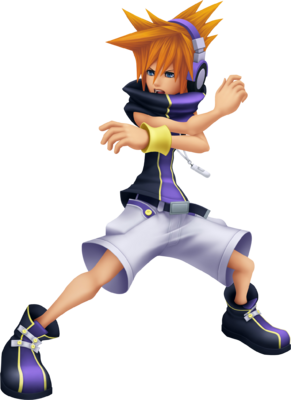 Neku Sakuraba is a character who appears in Kingdom Hearts 3D: Dream Drop Distance. He appears in Traverse Town. Neku is one of the first characters to appear in the Kingdom Hearts series who originated from something other than Disney, Final Fantasy, or Kingdom Hearts fiction, although he is from another game that is property of Square Enix, as well as being designed by Tetsuya Nomura. Neku and his friends are meant to serve as tutors to Sora and Riku, in the same role as Leon and his friends from the first game. Neku's power is channeled by the Book of Prophecies to create the Neku, Illustrated Neku, Neku & Joshua, and Neku & Shiki & Joshua medals. Neku shows Sora the timer on his palm. While looking for Riku, Sora stumbles across Neku, who is hanging off of a nearby roof. Neku jumps down from the roof, asking Sora if he will help him in "the Game", but after looking at Sora's palm, he realizes that Sora is not part of the Game. He shows Sora his own palm, which is marked with his remaining time in the Game—just over forty-three minutes. Sora offers to help Neku win the Game, and though he comments that he was looking for a partner, Neku refuses, saying that they've just met and can't be considered friends yet. Neku leaves to continue the Game, and Sora chases after him. When Sora catches up, the pair is attacked by Dream Eaters. After quickly disposing of the Nightmares, Neku explains the concept of Spirits to Sora and teaches him how to create one. They are once again caught off guard by Nightmares and the two are forced to split up. Sora eventually catches up to Neku in the Third District where they are confronted by a man in a black coat, whom they later learn was a young Xehanort. Neku tells the man that he had brought Sora, and it was time for him to hold up his end of the bargain. The man motions to attack Sora, but Neku jumps in front of him in defense, saying "You said you wouldn't hurt him!" Sora then blacks out. Sora later catches back up with Neku in the Fifth District, who is feeling some regret for betraying Sora. Always willing to forgive, Sora looks past it and presents Rhyme to him, hoping that he'll be able to jog her memory. A giant Nightmare appears and Sora quickly defeats it. After that, Joshua appears and explains the nature of the Sleeping World to Neku. Neku disappears after being reunited with his Game partner Shiki with the help of Joshua. Later, Neku and Shiki are confronted by Spellican. However, they are greatly outnumbered as more Dream Eaters arrive at the scene. After Sora appears to assist them, Neku introduces him to Shiki, but becomes embarrassed when he talks about how desperate he was to find her. Joshua appears and explains they need to trap Spellican. As Sora and Shiki chase after Spellican, Neku tells Joshua that he considers him a friend as well and hopes to see him in Shibuya. While Sora fights of the powerful Dream Eaters summoned when Spellican is cornered, Neku helps take out the weak ones. When Spellican flees to Symphony of Sorcery, Neku is content to let Sora chase after it to finish the mission. Neku and Shiki say once Sora is ready, he should come to visit them in Shibuya someday. Neku is a rather lanky teenager. He has distinctive spiky orange hair and blue eyes. 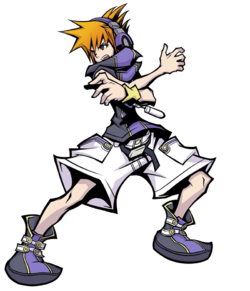 Neku wears a pair of purple colored headphones, with the tube-shaped white audio player hung around his neck. Neku wears a sleeveless, purple-grey shirt with a high collar that has a purple stripe going down the middle, with the stripe outlined in yellow. He wears white shorts, held up by a loose-fitting black belt. The shorts have two large pockets with purple stripes on top, the stripes also outlining a pair of yellow buttons on each pocket. His shoes match the design of his shirt, purple-grey with a purple stripe outlined by yellow. The shoes have four yellow buttons with white straps that replace shoelaces. Neku sports a yellow sweatband on his left wrist. As a Player in the Reaper's Game, Neku is occasionally seen with a mission timer on his left hand. Neku's render mimics his official artwork from The World Ends with You. Neku's initial personality is generally unsociable and almost a polar opposite of Sora's. He finds it hard to trust people, wondering how Sora can trust him so easily. He also values being independent, once refusing Sora's help to fight Dream Eaters. Though at first his negative world view keeps his friends alienated despite their best efforts, Neku slowly softens as he listens to the advice of everybody around him. He becomes more open and trusting as he gets to know people like Sora, Shiki, Joshua, and Rhyme. As time passes, he begins to understand more about others and believe in his friends, and see how having friends can make life easier. In the end, Neku thanks Sora, saying, "It wasn't easy, but you made it easier." "Who needs friends! They just laugh and talk like idiots and pretend to agree with you—so you end up caring about them... exposing yourself... getting HURT... Screw it! We're better off without them! You want people getting in your way? Dragging you down? I don't!" Neku Sakuraba is the main protagonist of The World Ends with You, a role-playing game developed by Square Enix. Born and raised in Shibuya, Neku is an ardent fan of graffiti art. He hates people and makes every effort to seal himself off from the outside world, even wearing headphones wherever he goes. At the start of The World Ends with You, he claims he "doesn't get people", and because of this, he usually dislikes interacting with other people. His opinion of others is so low that he tends to see people only for their use. Neku refuses company, as he feels that friends only drag him down, cause him pain when they fail him and make him feel like "unnecessary baggage" to them. Neku sees society as simply an annoyance that forces their values on him, pester him and expect him to do things he doesn't want to do. As such, he admires the designer CAT for their motto, "do what you want, how you want, when you want". Neku's life takes a turn when he wakes up lying facedown in the middle of Shibuya's Scramble Crossing, with his name the only thing he remembers. While attacked by creatures called Noise, Neku met Shiki Misaki and partnered with her since they both need each other to survive the Reaper Game. During the week, Neku met Beat and Rhyme while learning of the Reapers and that he is actually dead. By the end of the week, after defeating the Game Master Yodai Higashizawa, Neku was given back his memories, the entry for the Reaper Game. When told he would be involved in the second Reaper Game, Neku is horrified to learn that Shiki is his payment fee. Neku meets Joshua during the second week and, despite faint memories of being killed by the youth, partnered with him until his assumed death at the hands of the Game Master, Sho Minamimoto. During the third week, Neku is partnered with the rouge Reaper Beat, and the sole mission of the week is to find and defeat the Reaper, Mitsuki Konishi. However, though managing to defeat her, Neku learns the role he played as Joshua's proxy with Shibuya's Conductor, Megumi Kitaniji, whose actions served to save Shibuya from destruction from Joshua, as his final opponent. Soon after, Neku is offered a chance to save Shibuya by killing Joshua in a pistol duel. Though he refused to shoot Joshua, now trusting him though still unable to forgive him, the fact that Neku slowly opened up to the outside world within three weeks convinces Joshua to spare the district while giving Neku and his friends a second chance in life. When Sora meets Neku, a remix of the song "Twister" plays, a recurring theme from The World Ends with You that appears in multiple arrangements throughout the game. ↑ In a video of Kingdom Hearts 3D, it can be heard while Sora talks to Neku.